Over the years, John Taglieri released album after album as a solo artist. His work didn’t remain unnoticed as he shared stage with big names in the popular music scene and was nominated for many prestigious awards, winning several of those. Apart from being a successful independent musician and songwriter, Taglieri is also known for his diversity and creativity. Unlike many bands and musicians he has never been afraid to take a leap of faith and try something new. Musically he knows his strengths and musically he has a strong basis to work from. But the way he has approached his musical projects over the years has varied from time to time. From full-length albums to EP projects to combining his music with graphics and literature, you name it, John Taglieri did it. His most recent project was a collaboration with Gil Gonzalez, a project called “LiVES” which combined short music albums with short stories/novels. Many of the songs from those EPs ended up on the new TAG album “FOREWARD”. But even if you’ve heard the LiVES EPs, you should not be disappointed, because even though the songs were written and recorded before, they sound a whole lot different on this new album. “FOREWARD” can, and should, be judged as a debut album. While John Taglieri played with Brad Whitley & Tom Darby before, this is now really a new project, a real band project and it sounds as such. With the addition of bassist Dave Willard and with Rob Jackson on drums and percussion there’s a more complete and even more energetic sound that is both honest and exciting. While these songs were quite convincing on the “LiVES” albums these new versions are better layered, better balanced and frankly, they literally just rock more. The added energy and musicality makes these songs stand out more. The infectious Breathe and the pointy Make A Mistake With Me are excellent candidates for radio singles and the uptempo Ghost makes for an energetic rock piece that can do wonders on stage to energize the crowd. And include splendid rock anthems like The Lives of Splattered Flies and With You I Want To Be and you have a fairly complete debut album. The songs belong with one another, the original theme tying them together, while there’s new fire, new life to the music. And it’s not just the songs that fit together, also the band members show they have a great feel for each other’s talents and work together like a well-oiled machine. “FOREWARD” is a more than solid debut for this newly formed band. The individual band members may be experienced but for playing together this is a new venture. If they do this as well as their first album together, there is no need to worry. Musically it’s tight, it’s energetic and most importantly it’s interesting. You want to keep listening to this. The album is capped off with a nice cover of Incubus’ Drive, which fits perfectly thematically. Also, musically it doesn’t stray too far from what TAG shows on the album. I’m not usually a fan of covers and this version is by no means the original, but thankfully it’s not just a copy of the original song, TAG tried to make the song their own and if you didn’t know it was a cover, they might just have fooled you there. All in all, good debut, solid performance, strong songs, a few exceptional songs. TAG is off to a good start and with this enthusiasm, energy and power, there is bound to be a lot more in store for these guys. If you enjoy honest and catchy rock & roll then I can recommend “FOREWARD”. Taylor Carson is a storyteller. An old-fashioned balladeer. In the tradition of Bob Dylan, Neil Young, James Taylor, Josh Ritter and the likes. You may notice I refer to some of the very, very best in the history of storytelling music. I do this on purpose to accentuate how Taylor Carson steps up his game on “Defending The Name”. He’s been out there for awhile, releasing music every so often. But with this new release he takes a huge leap forward and this album is bound to give him some well-deserved recognition. Right from the opener, Moonshiner, this (sort of) autobiographic album starts to paint he picture of Carson’s family tree. He continues this trend down throughout the album, which features 16 songs of the highest quality. And through the classic mold of balladeering Carson doesn’t lose sight of the pop sensibility in his songs. Listen to Five, Freight Train or Smoke for example to hear what I mean. “Defending The Name” is an album that is versatile. You may think that is a bold statement, but some of the songs tell a story that you just want to hear until the end, some of the songs are so endearing you can’t let go and there are songs that are simply beautiful in their simplicity. Carson uses the lyrics as an additional instrument and enriches his songs by interweaving the music, the lyrics, the story, the feel, the message, the rhythm, the melody, everything to a collection of songs that breathe life, that breathe emotion. “Defending The Name” is by all means a modern-day masterpiece and Taylor Carson shows he’s ready to take the step into the spotlight that he now more than deserves. Last year I reviewed “Lessons To Connect”, with which The Twees debuted on scene. I was pleasantly surprised by the energy and enthusiasm they showed on that release. They return with a 2-track single release. “Unfair Affair” features the title track and the song Hepburn Shades. Not everything is perfect and sometimes things are a little raw, but the effort makes up for that in tenfold. And frankly, the rawness of it all fits with the danceable rock & roll this band creates. In the past we reviewed and worked with bands like The Craze, Little things that kill, The Crash Moderns, Welbilt and the likes and I would place The Twees in the same niche of the genre. The playful, danceable indie/rock that makes sure you start moving. The music is infectious and has a lot of drive. The actual single, Unfair Affair, is an energetic, forward-moving song that is very pleasant. It’s a song you can get a kick out. Hepburn Shades is a little more plain, but it also has an energetic drive and makes for a good b-side to the single. It’s only a little taste as the band plans to release another full EP in January of 2011. But for now you can enjoy these two musical candy canes to get through the holidays. Sign up for their newsletter and you even get the songs for free. Don’t miss out! The Excelsior label brings us one of their newest talents: Tim Knol. This young musician is rising fast in the ranks, playing with label mates Johan on their farewell tour and getting a lot of support from other good bands and musicians. Therefore, his debut album is already a highly anticipated one. I, for one, was really looking forward to hearing what a full length would sound like. Starting with Clean Up, which has a bit of a 60s/70s British vibe to it but also reminds me of fellow Dutch act ‘Solo’. It has a nice little feel to it and some clever bits in the arrangement. One of the more exciting tracks on the album. Then Sam, which is probably the album’s best track. The groovy edge to it reminds me a little over Dylan & Springsteen. Singer/Songwriter with a rock & roll basis. Tim Knol comes across a strong performer and a gifted songwriter. The next track has a very fitting title. Cause it not just sounds familiar, it’s also called Sounds Familiar. The breezy, folky tune has a really comfortable feel to it. Very laid-back and soothing. Vocally it may not be the best track on the album, but it’s a pretty decent track. When I Got Here comes off a little weird the first and second time you listen to it, but the more you listen to it, the more you appreciate the melodic lines in it and the arrangement actually works. For some reason it makes me think of Donovan. The balladry shown on Find All The Love is sweet but not very exciting. It’s a safe song, well done, but it doesn’t stand out for me. No real climax or utter excitement here. It would, perhaps, make a decent radio song, and it’s sung with a lot of feeling, but yeah, a bit of a safe song. Only Waiting, however, I think is a possible single and one that I really enjoy. Lyrically very strong and one of Knol’s best vocal performances on the album. It is still laid-back but also has a very current feel to it. The track has excitement, build up and most of all it has body. It’s a complete track that could defitinely do something to the listeners of this genre. The faster-paced, acoustic Or So I’m Told, is a 60s-influenced song, or at least, that’s what it sounds like. And you always make me happy with a 60s-like sound. On top of that it’s pretty damn catchy and another sign that Tim Knol is a name we’ll continue to hear in the coming years. The happy, poppy When I Am King is another song that’s very suited for radio. Very inviting and very open, this song is guaranteed of airplay if released to mainstream radio. Would work great for commercials too. Must Assist is a track that grows on you. At first I wasn’t too excited about it, but by now it might be one of my favorite tracks on the album. It may help I heard Tim Knol live in the meantime, so knowing what he can do on stage brings something extra to the album as well, but Must Assist is a song that is quite impressive if you take some time to get to know it. A song with the title Music In My Room is something that is instantly appealing to me. So I was really happy that the song itself did also. This small, intimate, acoustic song is full of emotion and heartfelt lyrics. An absolute highlight on this interesting debut album. Me & A Lot Like You is a nice acoustic song, one that I really enjoy, but I think its placement on the album could’ve been better, though on the other hand it very naturally flows from the previous song. The next song is one that was already out. Silverman Hotel was already getting some decent airplay and it’s obvious why. It’s probably the fullest track and it has something about it. It’s not traditionally catchy but it does have the quality of sticking with you. It’s not hard to get into the song and it’s a pleasant listen. So yeah, good song for the radio. Then Driving Home, which is a track that wowed me. From the first note I was sold on this track. Musically I feel it lies somewhere between Brett Dennen & Solo and it’s a wonderful gem of talent and music. This is the track where Knol delivers, in my opinion at least. The album closes with Deepest of Oceans, which is a nice closer but not the most exciting track on the album. It would’ve been nice to have ended with an epic song or a very emotional, intimate song, but unfortunately that didn’t happen. Deepest of Oceans, however, is another proof that Tim Knol deserves his place among the rising stars of Dutch pop music. This debut album is impressive but it doesn’t propel Tim Knol into legendary ranks just yet. In time this singer/songwriter will most likely bring more excitement and variety to his music and become an even more accomplished musician. He shows his promise and in the future there will be time and opportunity to fully develop his gift and become one of the Netherlands’ leading singer/songwriters. 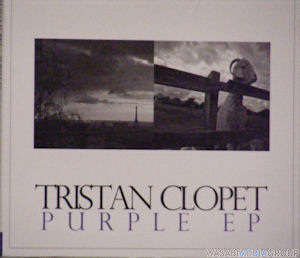 Tristan Clopêt is an up and coming artist who makes a kind of music that can best be described as a mix of modern rock with alternative influences from the 80s, 90s and with a funky undertone. Some people have referred to Jeff Buckley and Red Hot Chili Peppers. I can definitely see the RHCP references, especially in the opener and Ethereal Evidence, yet I feel like it’s only partially fair to make that comparison, especially if you listen to a track like So Alive which falls more in the category of early Snow Patrol, Feeder & Republic of Letters, with the more anthemic build up. Overall it’s a pretty solid EP that shows talent in songwriting. The vocals are excellent, they really are and the guitar work is very professional. Everything fits together quite nicely. And while the songs are solid and well-written and sometimes even quite catchy, there is something about them that makes me wonder about the commercial successfulness of this EP. I’m convinced local radio will pick up on it, and the songs lean themselves perfectly for live performances as they are filled with energy and emotion. Personally I actually like how the production of the songs is kind of raw and down-to-earth if you will. But for the songs to be embraced commercially I think the whole thing should sound a little more polished. At the end of the day, “Purple” is a solid EP, containing 6 strong songs, songs that grow on you the more you hear them. Good songs possess that quality. Listening to this release gives me the feeling I’m listening to a real musician, not just someone who can play a nice song convincingly, but a real musician who invests in a song and gives everything to let it come out. I have to give Clopêt praise for that, as that is what music is about. It’s about the energy and emotion you put into it and the connection you have with it yourself as well as the connections your listeners can have with the music. I believe that Clopêt gets that and you can hear it in the music. Whether the songs on this EP will mean a breakthrough for him, I’m not quite so convinced yet, but I do hope it offers this musician opportunities to take his career forward, because he holds the talent and musicality that deserves to get a chance. The mix of modern rock and different alternative influences makes for interesting variety in his music. Songs like Superficiality Is A Sin & Love And A Question are excellent songs and should convince you of this man’s potential. Check out his songs and judge for yourself. Tru Blue is the brainchild of current and former members of The Derelicts and some other great musicians. They put together an album with eight songs that are pretty much a definition of music. Mashing many different influences (rock & roll, reggae, americana, folk, blues, etc.) together into a very pleasing package, Tru Blue delivers on a very, very solid album. Starting with the funky title track, Smells Like Music, the album is off to a good start. The talented Judah Tafarhi takes on the lead vocals and brings reggae right back in our hearts. This track makes you feel the sun is shining. Shame To See You Go has bluesy vocals and a very nice, groovy melody. While the vocals and guitar have a bluesy influence, the song also hints at Westcoast influences at time. It’s one of those tracks that just makes you feel good. The album continues with the more intimate, folky Alone & Waiting, which is the money track for me. Impressive vocals and a very complete arrangement. The instrumentals are subtle when the vocals are present and when it’s just instrumental the band shows excellence! Next up, Do The Best You Can. And Tru Blue definitely did. What an amazing funky rock & roll song. And remarkably catchy also. It has an edge, it has mystery, it has balls. It’s music like you don’t hear very often anymore. And then the band follows it up with a cool americana track called Between Us, which is the most natural and organic sounding track on the album. On My Mind has a very cool intro, and while I like the arrangement of the song, it is my least favorite track on the album. I miss some excitement, some spirit in this song. Musically it’s sound, but maybe it carries on too much. On You Just Got Here they pick it up again and the folky approach works really well and it’s just such a pretty song. Very well done. After that highlight, they close the album with Where Will You Be When I’m Gone. It’s an ending you’d like to hear to an album. Nearly 6 minutes of absolutely enjoying good music. And just imagine how good this would sound live! “Smells Like Music” doesn’t only smell like music, it sounds like music. It brings together different influences, different musicians and a whole lot of music talent. Commercially this might not be the most succesfull album, but it’s a treat for the true fan of honest music!